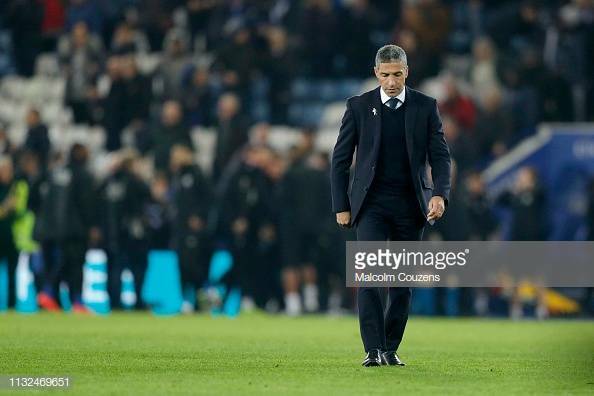 Chris Hughton walking across the pitch after Brighton's defeat to Leicester, Image courtesy of Malcolm Couzens on Getty Images. Brighton & Hove Albion manager, Chris Hughton remains optimistic despite his precarious position in the Premier League. The stats speak for themselves and they do not make for good reading for Brighton. They are without a win in 2019 and have gone from being seven points above to drop in 13th to 16th and just two points above the bottom three. If this wasn't a damming enough stat, The Seagulls sit right near the bottom for their form in 2019 in the top five divisions in England with only Port Vale and Maidstone United having picked up just one point in 2019. Hughton had the following to say and why he optimistic despite this: “Well I have to be concerned as the league table and form as regards to points speaks for itself. "But I think for where we are and the level of performance, a lot of games have been close games and even on the back of the Leicester game mid-week where I thought the performance was good and on another night we get something from the game. “So I think probably with all of them factors make us optimistic, makes us not too down and we are also very conscious that we are the level of club that will go through some difficulties in the season and probably up till four games ago." Brighton will be boosted by the return of striker Florin Andone, who has missed Brighton's last three games due to a ban for violent conduct. However, Brighton will be without two players for the visit of Huddersfield: “Pascal Gross will miss the game. I think the good news is he has felt his hamstring and it’s not too bad, but this game has come around a bit too early. One thing that can happen when teams are on a bad run like Brighton are is that poor results can become a habit, but this is something that Brighton is not concerned about this: “Of course, it can, but our responsibility is to go from game-to-game and to assess and try to make the changes that you need to change your fortunes. “As I said, I think I would certainly be more concerned if we weren’t creating chances, we weren’t in the game and weren’t putting in the performances.